Fullmetal Alchemist Wallpaper: . : transmutation :. Minitokyo »	Fullmetal Alchemist Wallpapers » Fullmetal Alchemist Wallpaper: . : transmutation :. The circle effect makes me wait.... and think... "Holy Monkey! this wall is amazing!" Thanks for summint it! This wallpaper is simply amazing. I cannot stress that enough. Excellent work! Scary. The expression up top is pretty psycotic O_o Very nice job on the circle. 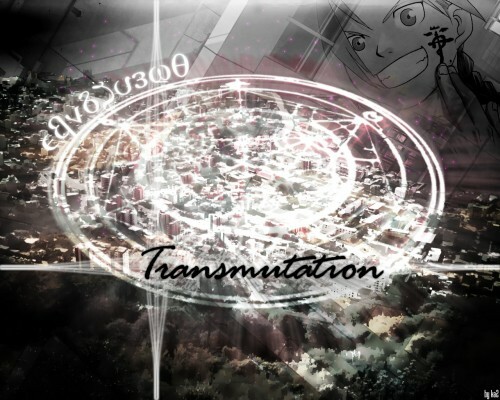 Beautiful transmutation circle, the effects are great. I am very impressed. It looks cool. But i think there is way too much going on to tell what it is when you first look at it. Oh!It's a very big alchmist battle array!!!!!!!!!!!!!!!!!!!!!!!!!!!!!!!!!!!!!!!!!!! looks cool! i love the glow effect on the array.